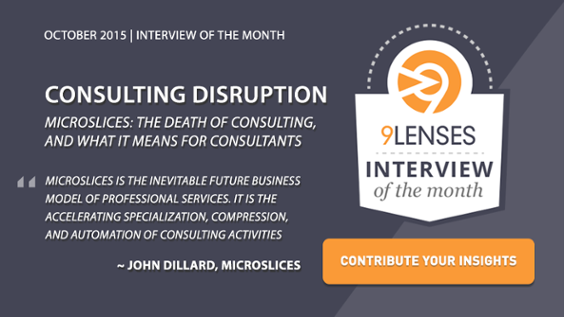 Consulting Industry News – October 2015 - 9Lenses, Cloud Assessment Platform. We Make Assessments Easy. The consulting industry today is more fast-paced than ever. It is on the cusp of disruption, and both consultants and their clients have to keep up with industry events and happenings. For this very purpose, we curated the latest and some of the biggest consulting industry news for your perusal. Read on! Polling more than 500 consulting professionals in the Asia-Pacific region, Bain & Company is voted the best consulting firm to work for. Factors of evaluation include prestige, practice area strength, firm culture, compensation, overall satisfaction, hours, and more. IBM launched the first consulting organization –IBM Cognitive Business Solutions. This solution will help introduce a new model of business analytics to help clients realize their potential. Work-life balance is a globally relevant issue that companies are striving to address. The lastest new initiative to support better work-life balance comes from BCG, which started its “switch off” policy in its India branches. Susan Doughty, an industry expert in the design of contemporary reward strategies and solutions and a certified Global Remuneration Professional, spoke about being in the consulting industry as a woman. Deloitte launched a new APAC centre will aim to promote regular dialogue with regulators as well as help provide insights into managing the aggregate impact of regional and international regulatory policy. QuickFire, is a brand new consultancy, which aims to simplify consulting. The female director of the prestigious MBA program at MIT Sloan School of Management calls for a more gender-diverse student population.